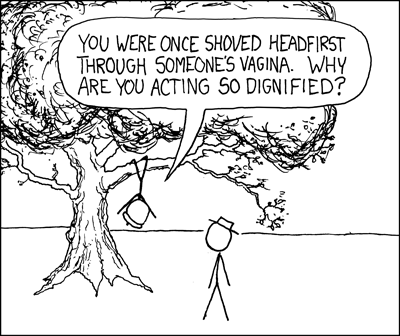 Do you read XKCD? From reading Neal Gaiman’s blog, I discovered this fun “cartoon-off” between a New Yorker cartoonist Farley Katz and Randall Munroe of XKCD. I think Randall wins, personally. I’m off to Tucson for a work conference in a few hours. Not sure how much I’ll be able to blog. Prince Gomolvilas continues his fight against Prop 8. If you’re looking for things you can do to help, go here and here.